The 2011 NHL Entry Draft featured five Americans selected in the first round, the lowest total since 2008. However, there were 60 Americans taken overall, just two shy of the all-time record for Americans drafted (2007). U.S. players made up 28.4% of the players selected at the draft. It is the third consecutive year more than 25% of the players selected at the NHL Entry Draft were American. So while the first round numbers were down this year, the overall numbers were up. Not a bad trade off. First off, St. Paul was a fantastic host. It was my first trip to the Xcel Energy Center and I came away incredibly impressed with the facility and also the staff. The draft was a time for work to get done, but it was also quite fun. For whatever reason, I realized more this year than in years previous that 217 draft picks sounds like a lot… but it isn’t. You look at some of the players that didn’t get drafted over the weekend and you think, well how didn’t he get picked? In the end, there’s just simply not a lot of picks. You can’t argue with a lot of the picks later in the draft, so when certain guys get left out, it might be surprising, but only a little. There just aren’t enough picks to go around. Last, but not least, it’s always safe to expect the unexpected at the NHL Entry Draft. Nearly impossible to predict, whether you talk to scouts or not, the pool of players and the way teams view those players is hard to gauge. That’s the beauty of the draft, of player evaluation and prospects in general… its unpredictable. I think that makes the Draft more fun. Plenty of surprises along the way. The NHL Entry Draft is a great event, regardless of what happens before, during or after. It was a pleasure to be a part of it for the first time and I hope I’ll have a chance to go again in the future. Now it’s time to dive right into this thing. Coming up after a jump, a look at each of the first rounders in depth and what their new fan bases might be able to expect. Jamie Oleksiak was the first American selected when the Dallas Stars took him at No. 14. The guy is huge, but I still marvel at his massive improvement over the last three seasons. I don’t mince words when I say that two years ago, Jamie Oleksiak was not a very good hockey player. He wasn’t bad, but far from elite. Certainly not a kid that you would look to as a first rounder, but because of his size, you would think, maybe he could find a way, albeit much later. It was always hard to remember he was merely 16 years old at the time. Now, at 18, he’s developed into a man and he’s playing the game like a man. The best part of it all is he is still developing and still getting stronger. It seems like everyone wants a piece of Oleksiak these days. The Saginaw Spirit are reportedly hot on Oleksiak’s trail to get him to leave Northeastern for the OHL. Now that Northeastern head coach Greg Cronin has left to be an assistant with the Maple Leafs, Oleksiak’s collegiate future is further in doubt. The hulking defenseman also has two countries fighting over him for his international allegiance. Non-committal answer, which was to be expected, though others close to Oleksiak have said they believe he’ll play for Team USA. He has represented the U.S. in the past at non-IIHF events. J.T. Miller was taken with the next pick by the Rangers and some thought him to be a reach. I was not one of them. Even though I had him listed as my sixth best American player available for the draft, he has first-round talent. The only issue with Miller is figuring out what kind of player he is supposed to be. Because of that identity crisis, there are issues with his consistency. The skills are certainly there, however. The skating is continually improving and he’s really begun to round out his game. His overwhelming strength and power have given him an advantage over his peers. The thing with Miller is he has great potential, but he has to mature as a hockey player. If he does, the talent is Top-15 worthy to me. The Rangers are taking a leap of faith, but its only a small one. I’ll be writing a little bit of a more in-depth analysis of the Rangers’ pick of Miller for Blue Seat Blogs soon, so be sure to check that out. As a side note, Miller said that his father wanted to get him involved in hockey after the Penguins won their second Stanley Cup in 1992. “Who knows, if the [Penguins] wouldn’t have won, I may not be sitting here right now,” he said. Ladies and Gentlemen… The Stanley Cup Effect. Connor Murphy was picked up at No. 20 by Phoenix, and let’s just say the Coyotes did their homework. Murphy said the Coyotes met with him at least four times, including an interview in Phoenix in the week leading up to the Draft. Understand this, Yotes fans, Murphy is a long-term prospect. He’s missed a lot of time over the last few years due to his back injury, but everyone feels he’s past the injury. That said, he’s got to make up for lost time. The fact that he’s as good as he is, without playing much is a huge testament to his natural talent. He probably will need a few years at Miami University before he’s ready, maybe even the full four, but there’s no doubt he can develop into a top four defenseman over the next few years. Stefan Noesen was selected at No. 21 by Ottawa, and while some may think it was a reach, consider that the Senators already grabbed Mika Zibanejad at No. 6 and did not have another pick until No. 61. They got their guys. Noesen is a very interesting prospect because of his vast improvement over the course of the last season. Was last year a statistical anomaly? Or is Stefan Noesen that good? Based on what I’ve seen and heard, he is that good and has a chance to be better. Noesen said he felt his first season in the OHL was “a very big learning experience.” He only played in about half the games that year and posted a measly eight points. Thanks to staying committed and maturing off the ice, he was able to put forth an incredible effort in 2010-11. His 77-point explosion was no fluke. Noesen is also a native of Texas, and is part of a growing population of hockey players in the Lone Star State. The elite talent coming out of Texas is reaching mind-blowing proportions. Tyler Myers was born in Texas, but moved to Canada later in his childhood and plays for Canada internationally. Other than Myers, Noesen is the highest drafted Texan in NHL history. Though both may end up getting passed by Seth Jones in 2013. The game is growing and the talent is coming. There is a lot to like about Noesen, though, as a player. A lot of people have come away very impressed after viewing him, and clearly Ottawa thinks he can be something at the next level. I’m really looking forward to seeing how Noesen does in the highly intense environment at the National Junior Evaluation Camp in Lake Placid this August. He did mention during his media scrum that he hopes to be able to make the Senators out of camp. I don’t know if he’s there yet, but with a dedicated offseason, anything is possible. 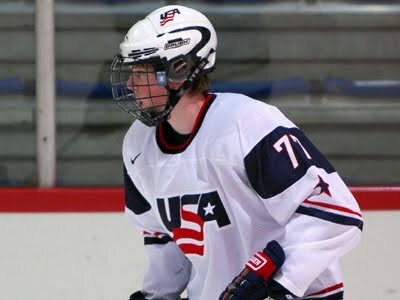 Tyler Biggs was the last American selected in the first round, and Toronto even traded up to get him. I had a very strong feeling the Leafs would take Biggs because he’s the type of kid Brian Burke absolutely loves. Biggs does have a long way to go offensively to live up to his first-round status, but regardless, he was one of the strongest, most physical players available this year. Burke loves truculence. Biggs has plenty of that. The thing about Tyler Biggs and his going to Miami University next year is that he’s going to have all the time in the world to work on that offensive side of his game. With no fighting in college, Biggs can spend less time in the box and more time on the ice. A lot of people say his game is better suited for the OHL. That might actually be true, but he doesn’t need to develop as a fighter, he needs to develop as a forward. He should be able to do that at a very offensive-minded Miami. There are plenty of gifted fighters that played college hockey, and lets face it… you don’t draft a kid in the first round because he can fight. That’s a big thing when you go to a market like Toronto. Can you handle the pressure? Can you handle the media? Biggs definitely can. If his offense progresses, he could end up being a great pick and I still like the pick now. Obviously he shows flashes of offense at times, but there’s still a ton to love about his physical game and his off-ice demeanor. He’s the type of guy that could be a fan favorite one day. The five Americans selected in the first round are all incredibly different players. That’s what is exciting for American hockey fans. There is a versatility in the players the country is developing. The U.S. has been developing defenseman at an alarming rate over the past few seasons, but the forwards selected in the first two rounds out of the U.S. look like they can be future impact players. That’s really great to see from a Team USA perspective. Coming soon, a look at some of the draft surprises among Americans as well as the picks I liked the most on Day 2. Also, if you have questions about a particular prospect or want to know more, feel free to let me know in the comments and I’ll answer as best I can. This entry was posted in American Prospects, Junior Hockey, NCAA, NHL, NHL Draft. Bookmark the permalink. Probably unrelated, but could help that Russians are slowly being eliminated from the Draft. With only 7 rounds gives a chance for players from a variety of countries who might have slipped out of the draft to get in earlier. Think with America doing a great job of putting out players that they will stay at a solid percentage and overall players being contributed. Think the Biggs pick was great for the Leafs. Guy really does have the game that Burke loves and really you need that kind of guy to win the bigger games. If his offence comes together then it’s an even better pick. Having dual citizenship and growing up a Leafs fan should just add to his popularity. Good point about College being good since he won’t be fighting and can work on his skills on the ice more. Excellent recap and great coverage on Twitter Chris. Lets keep our fingers crossed on Oleksiak as Canada has more than enough stars to compete in international play and the guys on TSN made is sound as if Team Canada really wants him. Next year should be a great draft for Americans, but I think this mock draft is just a bit… um… misleading.